Introducing the DC Comics characters as you've never seen them before! Jakks Pacifics' DC Big Figs Tribute Series features some of your favorite characters as limited edition figures in an impressive 1/4-scale. Each character is meticulously detailed and has a character-specific aesthetic. 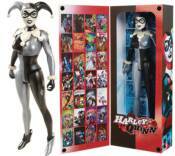 Harley Quinn (18' tall) features a glossy pearl and silver deco. Batman (18' tall) has a pop art aesthetic. The Flash (18' tall) features a metallic ruby deco scheme. Superman (18' tall) features a vintage Silver Age style. The Joker (20' tall) features a design inspired by Brian Bolland's work on Batman: The Killing Joke. Each figure boasts 7 points of articulation and comes in a gorgeous, display friendly storybook window box that features some of the most iconic scenes and memorable storylines for these iconic DC Character.